Electronics giant Samsung has launched its flagship smart phone, the Galaxy Note 5, which is the latest offering from the Galaxy Note family in India. Priced at around Rs. 51,000 (32 GB), this phone comes with dual nano slim slot, and is powered by a 64-bit Exynos Octa-core (Quad-core 1.5 GHz Cortex-A53 & Quad-core 2.1 GHz Cortex-A57) processor. Coming in three stylish colours and three different internal memory variants(32 GB, 64 GB and 128 GB), Samsung has decided to roll out only the 32 GB) variant in Black Sapphire, Gold Platinum and Silver Titanium colours in India. The new note 5 has a super AMOLED capacitive 5.7 inch touchscreen (Body dimension: 153.2 x 76.1 x 7.6 mm) and weighs 171 g. The screen is protected by the latest Corning Gorilla Glass 4. 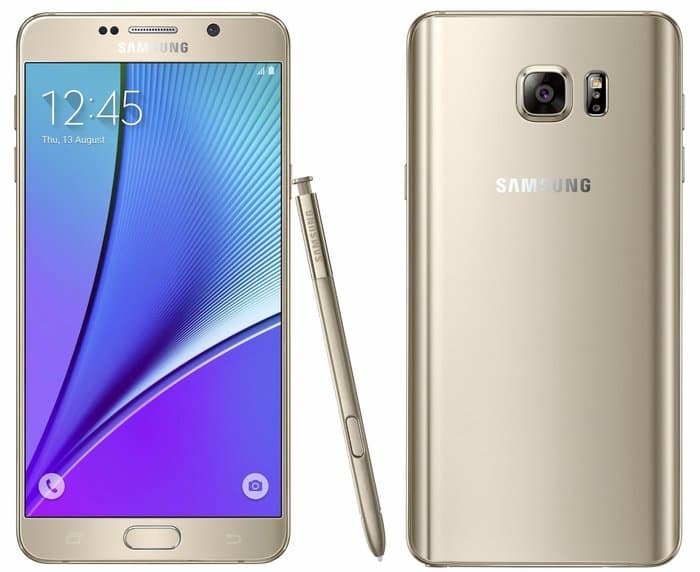 The phone runs on Android OS, v5.1.1 (Lollipop) and supports the Samsung Pay feature. In the new Rs. 51K gizmo, Samsung has added an extra thickness to support its new pen-like s-pen stylus with a protective cover. The smartphone sports a 16 MP f/1.9 primary camera and a 5 MP secondary camera. It also boasts of a 3,000mAh battery that supports fast-charging on wireless as well as wired chargers. In terms of connectivity, it supports Wi-Fi 802.11 a/b/g/n/ac, MIMO (2x2), Bluetooth 4.2 LE, ANT+, micro USB 2.0, NFC, GPS and 4G LTE Cat 9 / LTE Cat 6. Other features include a finger print sensor, proximity sensor and a heart rate sensor. Manu Sharma, director of product marketing at Samsung, India explained that Samsung is pressing for more dual sim phones in order to meet the need of the current generation. Sharma also added that Samsung would increase the production of dual-sim smartphones, as the company share increased by 48.1% after adoption of the dual-sim strategy. Samsung also confirmed that the 64 GB variant will be up for grabs in next few months, bearing a price tag of Rs. 57,000.